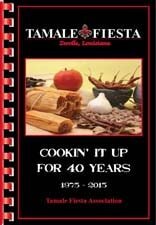 Zwolle Tamale Fiesta 44th Anniversary!!! My name is Cally Lang and I am the 34th Annual Zwolle Tamale Fiesta Queen. It is a great honor and privilege for me to accept the title, as well as, the responsibilities and duties that come with it. I am the 20 year old daughter of Robby and Kathy Lang. I reside in Many, LA with my parents. I have one older brother, Coby, who is a 2008 graduate of Northwestern State University in Natchitoches, LA. My maternal grandparents are the late A.B. Bunny and Lucille Peterson Ramsey of Many. My paternal grandparents are the late Willard Lang and Bessie McCartney Lang. Also I am the great granddaughter of James Henry Peterson and Mary Pearce Peterson of Zwolle and C.C. and Lertie McCartney of Marthaville, LA. I am a 2007 graduate of Negreet High School. While in high school I was very active in several organizations such as, Fellowship of Christian Athletes, Future Farmers of America (where I held the position as president), Students Against Destructive Decisions, Yearbook staff, Student Council, Character Counts, and a Peer Leader. I was a member of the basketball and Louisiana Association of High School Rodeo teams. I also received several honors as prom princess, FFA sweetheart, A/B honor roll, class favorite and friendliest. While in high school I competed in several state and national competitions. In the FFA I placed 3rd in the state creed speaking contest and 3rd in the state floriculture contest. In the Louisiana High School Rodeo Association I competed in the state finals for 3 years and placed 3rd in the cutting competition my senior year. I then went to the National High School Rodeo Finals and competed. I currently attend Northwestern State University in Natchitoches, La where I am pursuing a degree in Family and Consumer Science concentrating in early childhood education and a minor in housing and interiors. I am currently a junior and hope to receive my diploma by 2011. After graduation I plan to teach at a local school and be a part time florist. I am a member of First Baptist Church in Many, LA. I am active in the youth group and have volunteered for VBS and several other activities. I was baptized and became a Christian at this church. I enjoy spending time with my family and friends, church activities, attending and participating in rodeos, dancing, cooking, basketball, hunting and fishing, arts and crafts, working on the farm, at Lou’s candles and gifts, and at reflections, also like most women, shopping. I would like to thank my parents for sponsoring and helping me prepare for the Zwolle Tamale Fiesta Pageant. Also, to everyone else who helped me prepare for this exciting day of competition, thank you. For all those especially my mother and family to cope with the stress and nerves that come along with participating in the pageant I give a special thank you and all my hugs and kisses. 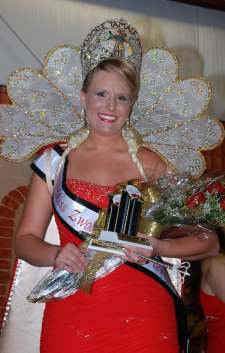 I am honored and it is a privilege for me to be crowned the 2009-2010 Zwolle Tamale Fiesta Queen. My goal is to promote our festival and the great town of Zwolle. I am ecstatic about telling people everywhere about the beautiful Town of Zwolle and how the people who live here are some of the friendliest people that they could ever meet. I am looking forward to explaining about our fiesta, wonderful tamales, and Spanish and Indian cultures, and the great time we have at the fiesta to celebrate this very important heritage. My hopes are to get more visitors to attend our fiesta and see firsthand what our heritage is all about.